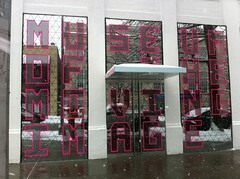 The Museum of the Moving Image in Queens, is one of those New York cultural treasures that I've been hearing about for years and years and just never got around to visiting. First off, it's in Queens, which is still somewhat opaque and mysterious to me. Secondly, uh, it's been a busy 15 years. And then it closed for renovations in 2008, reopening on January 15th. I visited the museum with Global Kids co-workers Barry and Sarah on a snowy Wednesday afternoon, the perfect geeky companions for exploring the very hands-on exhibits. The Museum has a very clean, white, modernist design, occupying just three floors, with the first floor taken up by a large movie theater. But surprisingly there was hours of exhibits, films, games and things to play with there. Our main reason we were there was to visit their showcase exhibit "Real Virtuality." The show presents six installations created by various artists and technologists to "create simulated worlds that extend, augment, or disrupt the physical environment of the Museum space." Since Global Kids is a pioneer in virtual worlds for education, this seemed like a natural for us. The well-known video installation artist Bill Viola created my favorite piece called "The Night Journey." It was perhaps the most intentional and "deep" of all the exhibits, an attempt to create a game-like spirtual enlightenment experience. Using a 3D engine and a game controller developed by Tracy Fullerton at USC, the player navigates through a very stylized landscape where one encounters dead trees, dead horses, and building ruins that connect to cutscenes of Viola's video work. The experience sort of worked for me, once I figured out the non-intuitive navigation and camera controls. The gamer in me grew quickly impatient with how slowly everything moved and how I had no idea if I was progressing, losing or returning to the same places over and over again. That said, I did have some moments of wonder and tranquility, just wandering around the open space and encountering unexpected objects and scenery. I spent about 20 minutes playing it, which I presume is much longer than your average museum visitor. Most disappointing were the "RMB City" installations. In this piece, Chinese artist Cao Fei uses Second Life to explore "the discrepancies between dream and reality in today’s hyper-capitalist China, exemplifying elements of discontent and disillusionment found in China’s younger generations." A giant screen projects a typical third person view of an avatar floating in front of the RMB City space, that you move around using a Wii controller. While I love Second Life, and I love seeing it brought into public spaces like the Museum of the Moving Image, I found the experience mostly annoying and confusing. The culprit was the Wii controller used to navigate through the Second Life space. I'm accustomed to using the keyboard controls to walk and fly around Second Life, to the point that it's second nature to me. And I've used Wii controllers in the past to navigate in-world and found it to be really fun and a qualitatively different experience. But this implementation was just too wonky for me. Too often I found myself spinning in place, trying to get my avatar pointed in a particular direction. As I tried to fly toward a destination, I would suddenly fall from the sky and find myself on the ocean floor. Barry had a similarly frustrating experience. I can't imagine what it must have been like for a random visitor with no Second Life background. The surfboard interface created to explore another related "RMB City" 2D space was similarly wonky. The connection between your movements on the surfboard and what was happening on the screen was impossible for me to detect. I did enjoy the Chinese-inspired artwork and illustrations in the piece though. By contrast, the "RealTime Unreal" installation by Thomas Soetens and Kora Van den Bulcke demonstrated what a more intuitive, less-laggy virtual museum experience can be. The user dons a pair of 3D glasses and then steps in front of two giant projected screens. An infrared tracker displays a digitized version of the museum space that moves as the user changes position. It's pretty neat. That said, once the "golly gee" factor is gone, there really isn't much more to get from the piece. And that overall was my problem with the whole exhibit. Beyond the "wow" effect, there was no particular themes or messages being communicated by the installations. I wanted the pieces to be about something more than just the technology and the interaction between digital and physical spaces. Perhaps that's because I have played and worked with these kinds of technologies before, I want them to represent something more than the fact that they exist. By contrast, just one floor down, the Martha Colburn film "Dolls Versus Dictators" demonstrates how a piece of artwork can remix different media — in this case dolls, photos, and animation — to make an interesting commentary about our world and real issues in a new and engaging way. Colburn throws together a wild mix of action figures, traditional dolls, and images of contemporary dictators (many of whom were unknown to me) and has them fight it out with funky, low-tech effects and stylized violence. As children, we grow up with and re-enact with our toys tales of action heroes saving the day against maniacal villains. And yet as adults we live in a world where brutal dictators still thrive and subjugate millions of our fellow humans. Watching these two worlds collide on screen is a brilliant and powerful juxtaposition that gives you wonderfully creepy and weird feelings. So the potential is definitely there. Perhaps it will take time for the museum-going public to want to pick up a game controller or put on a polarized pair of glasses and have something that powerful in their faces. It seems inevitable to me, given the way the technology is advancing everyday and become more and more accessible to normal mortals. For now, "Real Virtuality" at the Museum of the Moving Image was just a tantalizing taste of where we are going with user-driven/ artist-designed digital exhibits, but not much more. That said, I and my friends had a fantastic time at the museum and I highly recommend it for anyone who is interested in film, interactive media, virtual worlds and gaming.